BOISE, Idaho (AP) -- Vermont Sen. Bernie Sanders attracted thousands of supporters during his second campaign stop in Idaho. 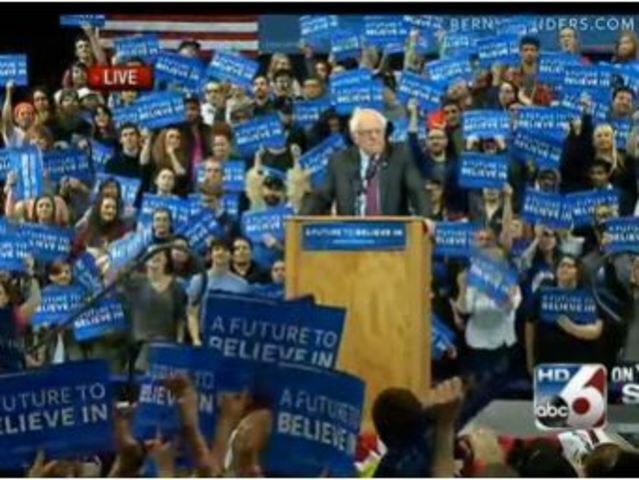 Sanders stopped to rally voters at the Taco Bell Arena on Boise State University's campus on Monday -- a day before the Idaho Democratic caucus. It's the same location President Barack Obama stopped to campaign eight years ago during his successful Democratic presidential bid. Supporters, mostly college-aged young people, stood in lines for hours to hear Sanders speak. Many held homemade signs that read "Bern Baby Bern," while others wore t-shirts with the popular campaign slogan "Feel the Bern." The Democratic candidate is trying to catch front runner Hillary Clinton, who has a strong lead in pledged delegates. She needs about 770 more delegates to win the Democratic nomination. Clinton has not made a public campaign appearance in Idaho, but did send Olympic winner Michelle Kwan to speak last week on her behalf.